On and off in the last 20 years (My Dok - where does the time go?). I tend to buy in spurts when the art or story particularly intrigues me. Be interesting to hear what stories have pulled you back recently. 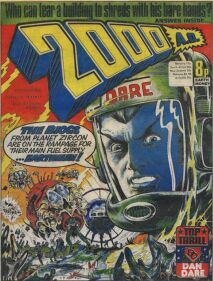 I'm pretty sure it was Prog 8 - I remember a dinosaur on the cover which definitely caught my eye! The Series is called Absalom, with the many character's name is Harry Absalom. The are is done by Tiernen Trevallion. If you like his art he has a strip that is running in the Judge Dredd Megazine No 398-399 called Strange Brigade. Someone once said that FP is where folks go until they discover real comic shops. Granted London is nowhere near the place it was in the halcyon days of the late 80's / early 90's but GOSH and Orbital still leave FP in the dust. Megacity is also worth a visit from time to time. I went to Orbital a few months back to do one of their themed life drawing evenings. Coincidentally, it was the evening I discovered that Instagram wasn't just a repository of z list nobodies taking bikini selfies and actually a number of artists I love were posting stuff to it. Not my local comic shop since I moved, but I'm sticking with Mega City Comics as my regular comic shop - they still had copies of the grey-scale Glenn Fabry 2000ad cover from last year last time I ventured into the older comics part of the shop.